Good idea for the challenge. The colors seem to be quite "true", especially with such a dificule combination so close together. Excellent composition with nice diagonal direction. Perfect lighting with no blown out areas and deep rich color. Wonderful! Very nicely composed with a relaxed feel to it. Just a minor visual distraction lower right edge - looks like a sofa cushion. Nice portrait - I like the diagonal, the shapes formed by the cropped guitar body and the skin tone, texture and position of the hands. Great lighting, I love the colors. Good texture. Good color and lighting. Nice pick for this challenge... good work! I very much like this image. 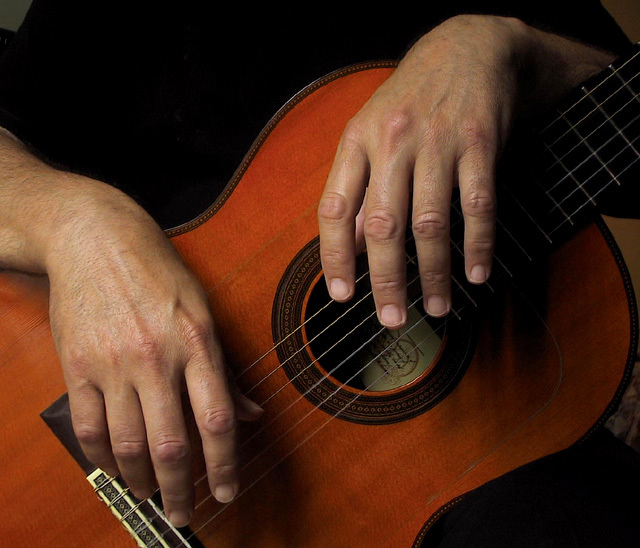 Particularly since it evokes rest to me, as most guitarists' hands are very busy with their craft. Only suggestion I can think of is a slightly tighter crop so the bits of color in the corners were gone (keeping the background black with the hands and guitar standing out), but really that's being picky probably. Nice strong image! I thought about doing something like this (but my instrument's bass), but didn't know if I could pull it off. Nice job. I like the soft light and the warm colors. A tip: I notice the jagged lines in the strings, which usually comes from resizing. Try resizing in steps (say 20% at a time) - it usually minimizes, if not eliminates this. Proudly hosted by Sargasso Networks. Current Server Time: 04/26/2019 07:42:50 AM EDT.